Please ignore the very pink (and yes also very painful) sunburn and feast your eyes on one of my fav and first outfit of the trip! 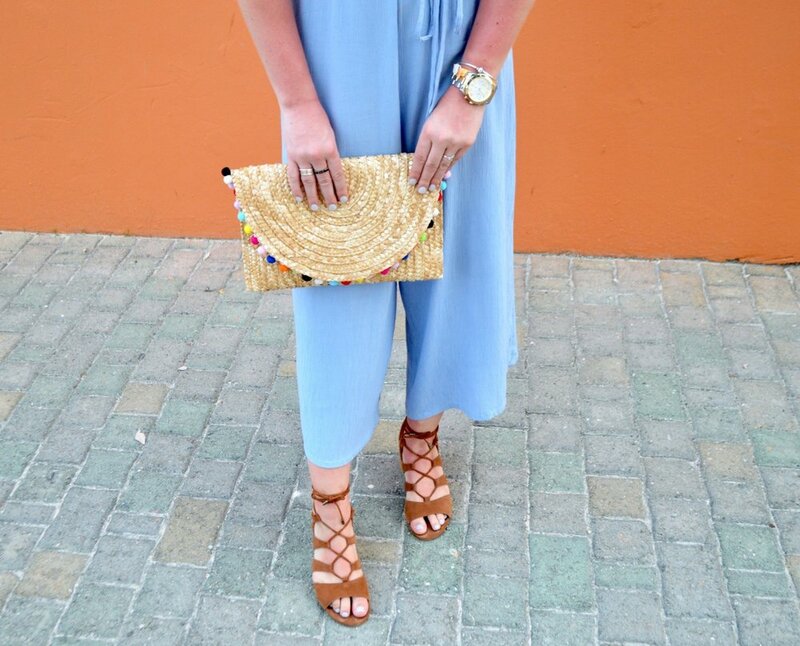 This jumpsuit was a last minute pick up from Aerie, pre vacation and boy am I glad I snagged it! It also comes in black online and in stores I saw an olive green version. It is very light, which is perfect for hot and humid destinations (and does wonders for sunburned skin!) The thing I love about this jumpsuit and really most jumpsuits to be honest is it has a palazzo pants feel and I LOVE palazzo pants! How can you not they are the most comfortable piece of clothing ever and they are totally acceptable to wear in public, that's what I'm talking about! Guess what else I'm talking about!? My to die for Tuckernuck pom-pom clutch! Tiny little colorful pom-poms make me happy! This clutch is spacious, which I find to be a bonus since most clutches can't even fit a pair of sunglasses in them and it matches more than you can imagine with its multicolored pom-pom madness. Thanks for stopping by, I'll catch up with you soon!